This summer I'm all about the pin up look - it's so easy and feminine. All you'll ever need is a cute midi skirt that accentuates your waist paired with high heels. When it comes to the top make sure and choose something tight - I went for a simple, white t-shirt with just a hint of irony. The secret is the hair and make up really: eyeliner, red lipstick, curls and a pair of cat eye sunglasses and you'll be ready to go! Descriere: Fusta verde deschis (mint) cu carouri minuscule albe, are volum datorita pliurilor din talie, se inchide cu fermoar in lateral, in fata are un sir decorativ de nasturi albi, are dublura alba, stare excelenta! 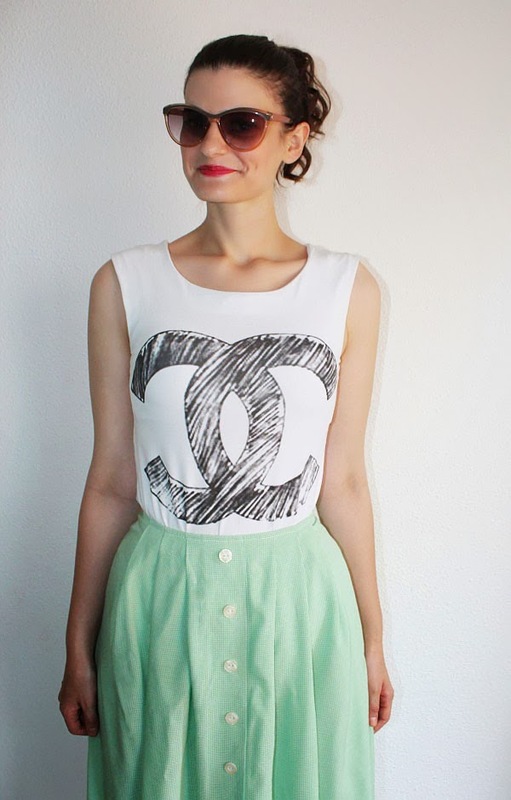 Descriere: Tricou alb fara maneci, elastic, cu imprimeu negru (logo-ul Chanel desenat ironic cu inscriptia Change), este nou! You look very pretty! Great outfit and the red lips look very beautiful on you!